For Shimkovitz, the arresting sound of kologo music, almost totally unknown to non-Frafra speakers, conjures a powerful sense of place. “When I first traveled to Ghana as a student, back in 2002, I was living in this neighborhood in Accra where a bunch of local guys were playing the kologo in an empty shipping container where we went to go smoke weed in the afternoon. I never forgot it.” But releasing Volume 7, and hopefully introducing Bola to a wider audience, seems to be more about recreating the moment of discovery itself. 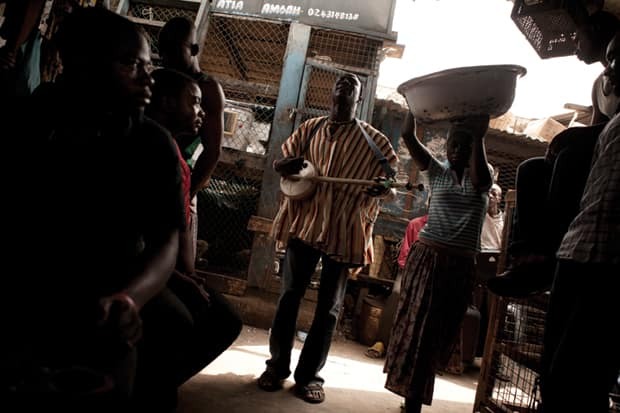 “Recalling these dudes singing and playing really repetitive and powerful jams,” Shimkovitz says, “made me realize how interesting Bola’s music would be to those who have never even heard kologo music or praise singing from northern Ghana.” Which is just about everyone. With the release of Volume 7 and planned shows this summer in Europe, that’s likely to change.